Until now it was thought that fin whales in the Strait of Gibraltar and the Alboran Sea made up part of the distribution of this species of whale in the Mediterranean. However, an international team of scientists led by a Spaniard has revealed that their population has been overestimated by including specimens from the Atlantic that visit at certain times the western Mediterranean, where the noise generated by human activity affects their survival. In 1991 the fin whale (Balaenoptera physalus) population in the Mediterranean Sea was estimated at 3500 specimens. A new study, published in Marine Mammal Science, now shows that this record included specimens from the Atlantic, and suggests that the distribution and size of the current population of this whale, which is threatened with extinction, should be reconsidered. "The Mediterranean population has easily been overestimated, as the census included the whole of the southeast Mediterranean, incorporating Atlantic fin whales within the Mediterranean census", reported to SINC Manuel Castellote, the lead author of the study and researcher in the National Oceanic and Atmospheric Administration (NOOA), Seattle (USA). The research team analysed 29,822 hours of recordings of the songs emitted by these marine mammals –which can reach a length of 27 metres, and are the second biggest cetaceans in the world– in order to identify the distribution limits of the Mediterranean fin whale and those of the north Atlantic fin whale in the Straits of Gibraltar, where the two populations overlap. The results reveal that the presence of fin whales in the areas of the Straits of Gibraltar and the Alboran Sea –southwest of the Mediterranean– is exclusively limited to Atlantic fin whales that visit the Mediterranean Sea, above all in autumn and spring. As a consequence, "the population of Mediterranean fin whales presents a much more limited distribution than currently described, excluding a significant region of the western Mediterranean", confirms Castellote, who highlights the fact that this region had previously been identified as a feeding area. The importance of the study is the critical state situation of the whale in these waters where it is the only mysticete (it has a baleen instead of teeth). The species is particularly susceptible to collisions with merchant vessels and ferries, which is the main cause of fin whale mortality. Among other threats, an "insufficient" knowledge of their basic ecological characteristics such as distribution and population size stands out. For the biologist, "from a conservation point of view, it is essential to understand the geographical distribution and population size of the Mediterranean fin whale, because if not, appropriate management methods cannot be implemented". Maritime traffic and geophysical exploration –including the search for hydrocarbons– "drastically" reduces the song effectiveness –linked to reproduction and which propagates hundreds of kilometres beneath the Sea– of the whales, which are also the group of marine mammals with the greatest acoustic sensitivity at low frequencies. "The noise generated through human activity in the oceans leads to possible chronic effects on the health of this species", Castellote states. To control these threats the same researchers identified in another report the possible impact of noise generated by human activity on the acoustic behaviour and geographical movement of the fin whales in various regions of the Mediterranean Sea and in the northeast Atlantic. After analysing 20,547 hours of recordings of the sounds emitted by the whales, the study published in Biological Conservation indicated that the whales modified the characteristics of their songs in order to try to reduce the impact of noise on their propagation. In addition the researchers recorded a massive displacement of fin whales, triggered by the noise from geophysical prospecting at a distance of 285 km from the study area. "These recurrent displacements, together with the changes in acoustic behaviour, could increase the energy expenditure and reduce the reproductive success of whales affected by the noise", the expert indicated. In the long-term the consequences for these mammals are clear: chronic effects which impact on their survival emerge. "Noise in the marine medium, despite being recognised as a significant pollutant, is far from being controlled and regulated within the waters of the Exclusive Economic Zone of Spain", warns Castellote. 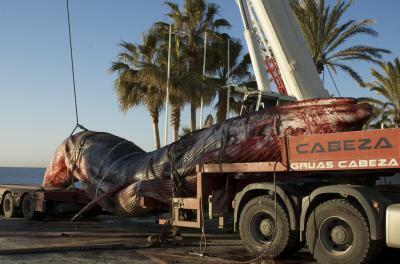 This is a fin whale which appeared stranded on the beach in Marbella (Spain) in 2008, the skeleton of which is on display in the National Museum of Natural Sciences in Madrid.